Conditions around here have really changed in the past 2 weeks, and this post goes up near the [predicted] end of 4 days of intermittent rain and thunderstorms which leave some of our crops looking better and some worse than before the rainy period. As for the dairy barn, it’s looking less like a barn these days. Windy and rainy conditions combined with, well, time and fortune, have led to cracking, creaking, crashing, and overall a slow sinking of the barn roof, which is totally fine as we finally decided this summer to ignore the behemoth for now, as we do not have the resources to do anything about it. For a week now, each night the sounds of settling roof and snapping lumber have reached us through the open window, and I am always waiting for the big crash that may never come. While we are ignoring the lost barn, we focus on the others! In our largest covered space (Greylock), onions, garlic, and winter squash is cycling through, and once dry we are storing them for market or as winter provisions for us. We are working on more organization of our principal indoor workspace (Warwick), which has extremely little storage. Shelves made from old barn wood are going up and all of the things are being hung on the walls (scythe, rakes, shovels, forks, hoes, brooms, weed trimmer). We have also finally begun using the chainsaw to remove select trees. The land in this photo has been pasture in recent years. The grass produces amazing straw, and the soil is rich and soft. The trees from this area will heat the house, and their removal opens a bit of space for development of mulched beds (also visible here) and a perennial garden/orchard, starting this coming spring with raspberries, at least. 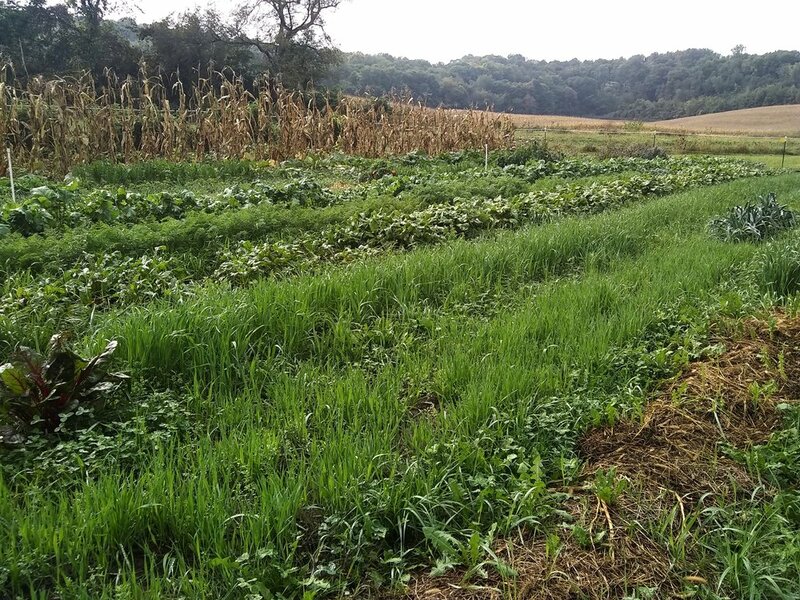 In the vegetable field, there is lush cover crop in many beds! I am trying a combination of oats and lentils this fall, and it seems to be working well. An important principle of soil (and water) health preservation is avoiding bare soil conditions: bare soil dries excessively and can easily be washed away by rain or blown away on a dry, windy day. Our approach to covering soil is either establishing a cover crop or mulching with straw or leaves or sometimes plastic, depending on weather, time of year, or other condition(s). There isn’t much information available regarding lentils as a cover crop, but I was very curious; the small seed size seemed ideal for broadcasting the seed by hand, which I did. It is a legume and thus fixes nitrogen from the atmosphere, converting it to a form plants can take up and utilize. Both oats and peas will die over the winter and leave a handy mulch residue in the spring. Finally, a photo from off-farm and from week before last, when it was hot, dry, sunny. We decided to ride bikes on the Red Cedar State Trail, and without initially planning on it, we extended the ride to Durand, a 30-mile round trip, with a chocolate malt break and short walk in Durand. Where the Red Cedar empties into the Chippewa, we were greeted by the most surprising (to me) landscape! Sand beaches along the river, flat expanses of prairie, and stunning oak savanna, which is the photo above. Back to farm thoughts, tomato plants are falling down and becoming increasingly brown (to be expected), and autumnal equinox occurs this weekend. Here in zone 4b, the average first fall frost is September 24, whitch means a lot more could begin to change in coming days.